Everyone in Folsom’s 93 is dead. That makes it difficult to score an interview with them, which would be very helpful. I’m forced to rely upon items they’ve left behind. Letters, newspaper articles, transcripts and other legal documents are my means of “getting the story.” I’ve also been lucky enough to find descendants of these men, their victims, or former Folsom employees, who have shared some stories with me. When early Folsom staff retired or resigned, they often took with them items; keepsakes from the prison. At the time, they seemed nothing more than a souvenir, but as years went by and they passed away, the items remained stored away and forgotten. Julie Davis of the Folsom Prison Museum said that Folsom antiquities have turned up at garage sales—sold to someone for just a few dollars. If we’re lucky, the buyer sees the significance of the item and brings it to the museum. 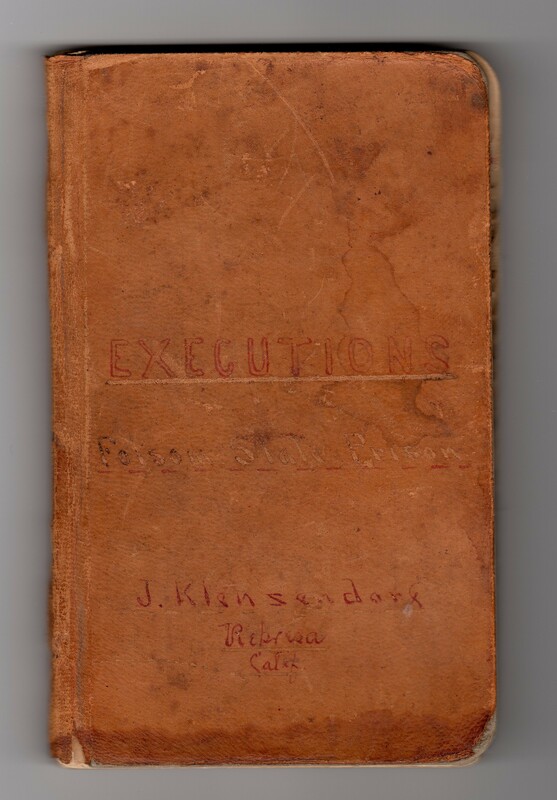 Imagine my delight when a gentleman named John Ackerman emailed me with his extraordinary find: A small book documenting the first 14 executions at Folsom prison. His Great-Grandfather, John Klenzendorf served as a Folsom prison guard at the turn of the 20th century. In 1903, Klenzendorf found himself thrust into the middle of a prison break where 13 inmates escaped and only 6 were recaptured. Two of the six hanged for their roles in the break that left a prison guard dead. Inmates took Klenzendorf, the warden, and other guards hostage as they fled the prison. The escapees let Klenzendorf go the following day, one of the last hostages to be released. 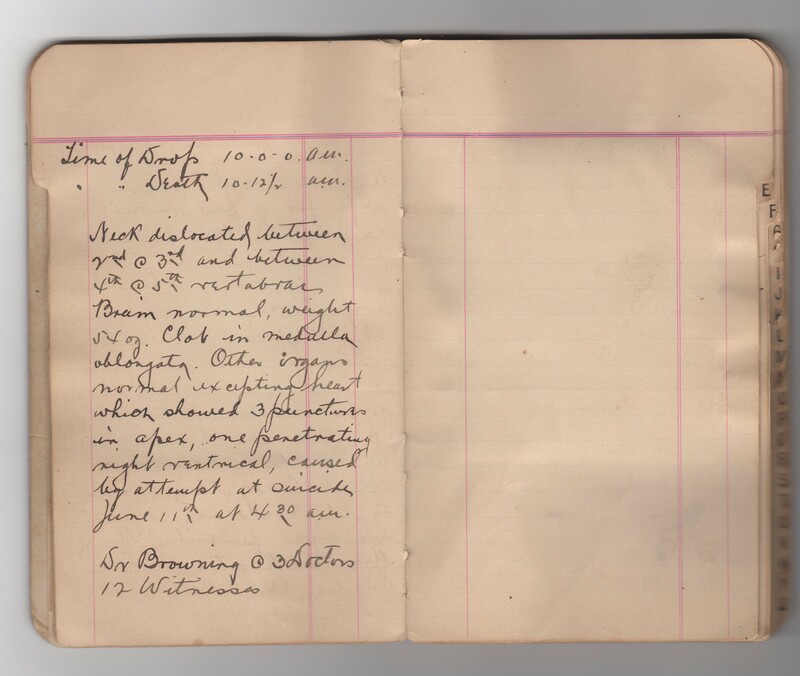 It appears Klenzendorf kept his own journal of the executions while he served as a guard. This book is actually an address book. If you look closely at the top picture, you’ll see the alphabetical tabs on the right side. From 1895 to 1902, Klenzendorf documented the executions by listing their name, height, length of the rope, and a brief story of the man’s crime. The top picture is of John Craig, Folsom’s 3rd execution, yet this journal lists him as number four. I find it very peculiar that Klenzendorf wrote the wrong date in his book, as I can only guess he witnessed the execution. My theory is that Paulo Kamaunu’s (#4) original execution date got recorded, which did come before Craig’s. Kamaunu’s date changed after he lost his appeal. I don’t believe it’s unusual guards kept these kinds of personal documents. Executions during this time were still a fairly new practice in 1902 for Folsom prison, even though men had been the guest of honor at these “neck-tie parties” in California since 1851. I’d love to get my hands on this book, but I’ll have to settle with admiring it from afar since it resides a couple thousand miles from me. I’d like to thank John for contacting me and supplying the wonderful photos of it. John will be meeting with Jim Brown, curator of the Folsom Prison Museum to determine more of the history behind the journal. I think I’m just as anxious as John to hear what he learns. It’s always great to encounter people who appreciate the historical value of these items and want to continue to preserve it. Thanks to John and Jim, this piece of history will be saved. 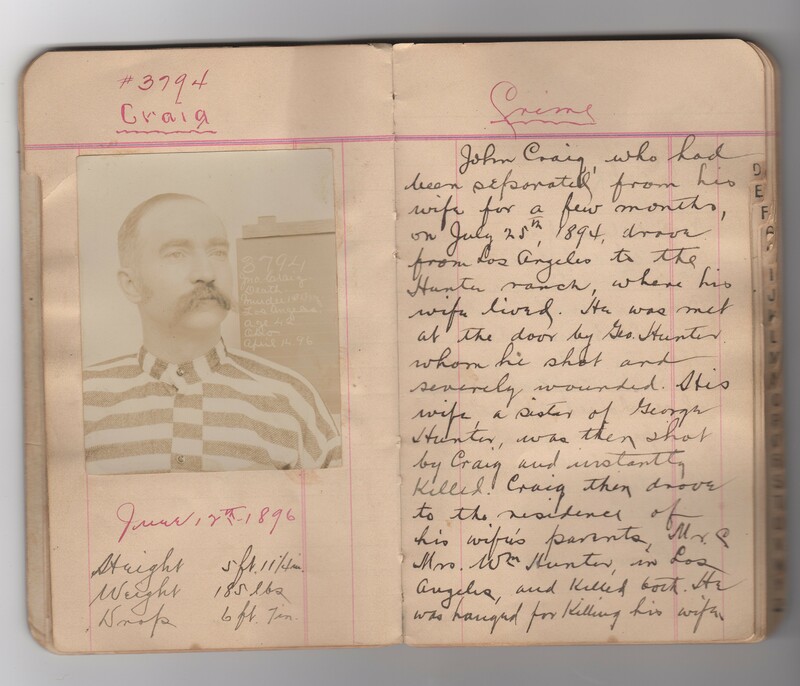 Categories: Folsom History | Tags: execution log, executions, Folsom hangings, Folsom history, Folsom Prison, hangings, John Klenzendorf, journals, writing | Permalink. This IS a great find. Maybe John will scan all the entries and send them to you. That would be great. This is fascinating. I hope you get more exciting surprises!